By Chloe, a new vegan restaurant that recently opened in Greenwich Village N.Y., has an open atmosphere, trendy décor, and great food, but unlike most vegan restaurants, there is a constant line out the door. More importantly, the majority of these people are not vegan. Every time I eat at By Chloe, an all-vegan restaurant, I hear people whispering in line about how they are not vegan. Could veganism be the new trend? I decided to investigate this idea by interviewing a variety of non-vegans who have eaten at By Chloe. Their reasons for coming were different. Whether they were dragged by a vegan friend, saw it on social media, or just because it looks like a cute place to dine, everyone agreed that this dining experience changed their perception of what it means to be vegan. Most of the people I interviewed agreed that all vegans were extreme hippies who ate weird foods. Jenny, a student at NYU, said that she thought all vegan food was just an attempt to recreate meat and cheese, particularly because she cannot comprehend how one can eat a full meal without these elements. Regardless of why they came, everyone agreed that the food was delicious. Stephen, a writer in New York City, said that he pitied people who were vegan because they didn’t get to enjoy food, but now he realizes that there are many food options that taste great and that are vegan. He even said that if more restaurants like By Chloe started opening up, he would frequent them. 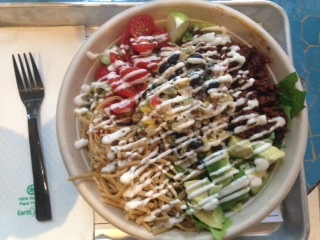 Miriam, another student at NYU, commented that since eating at By Chloe she has tried many other vegan restaurants and has started to lower her meat consumption. As this restaurant becomes more popular, perhaps a greater number of people will change their minds (and palates) about what it means to be vegan. Once we realize how easy it is to find great tasting vegan options in New York City, veganism does not seem like such a big obstacle in our quest for tasty food. Thanks to restaurants like By Chloe, veganism is being “rebranded,” making it the new cool, trendy way to eat. Only time will tell if this trend sustains itself and makes veganism a “mainstream” thing, but so far it seems to be moving in the right direction.